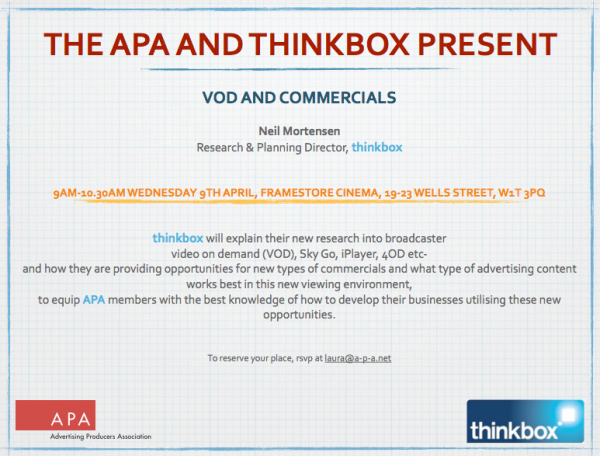 You are invited to our presentation with Thinkbox on Video on Demand and Commercials. Thinkbox promotes TV advertising as a medium and generate excellent research and guidance for advertisers to do that. This presentation will focus on what advertising content works best in the video on demand environment, valuable information to you in understanding how to evolve the content you create. Neil Mortenson is the head of research and planning at Thinkbox and the author of the report and will present the session.